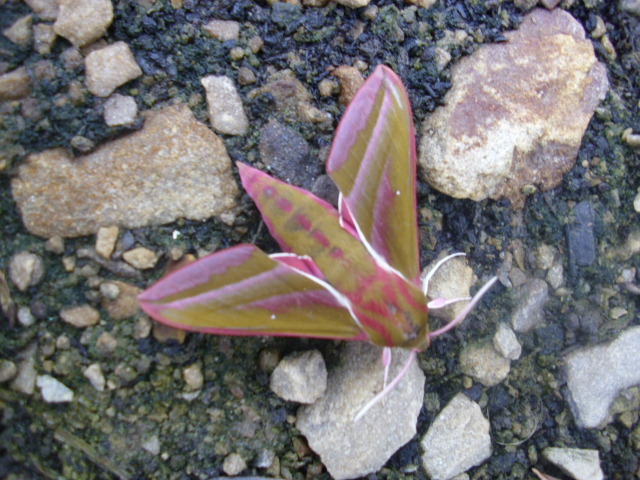 Elephant Hawk Moth & Gravel Garden. Spotted this on the bench in the polytunnel yesterday. Elephant Hawk Moth, is’nt it beautiful. It was there all day, I kept going back to look at it. 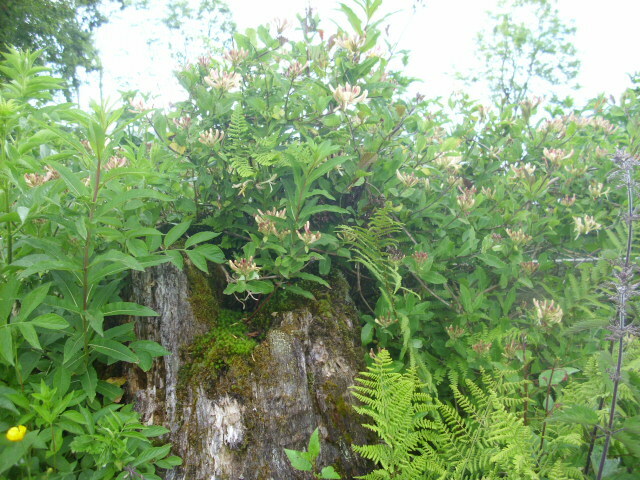 The larvae like to feed on Rosebay Willowherb, Fuschia and Honeysuckle. 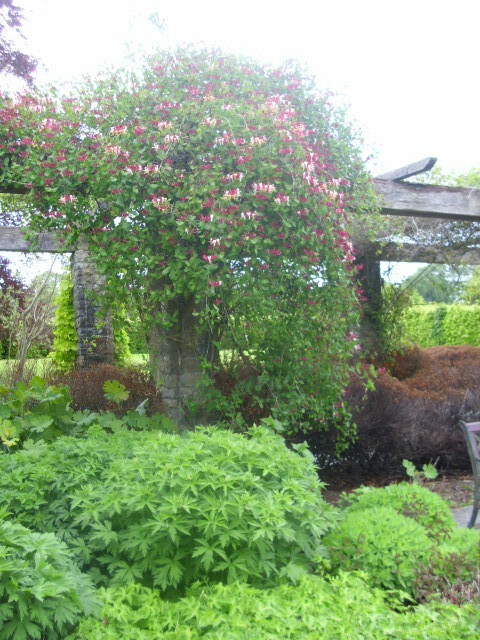 All plants that are growing in abundance here. For some time now we have been meaning to do something with the gravel area to the front of the house. Somehow all the garden work seems to be at the other side. Andy dug out the pond about 3 months ago, it is filled by the runoff from the roof. 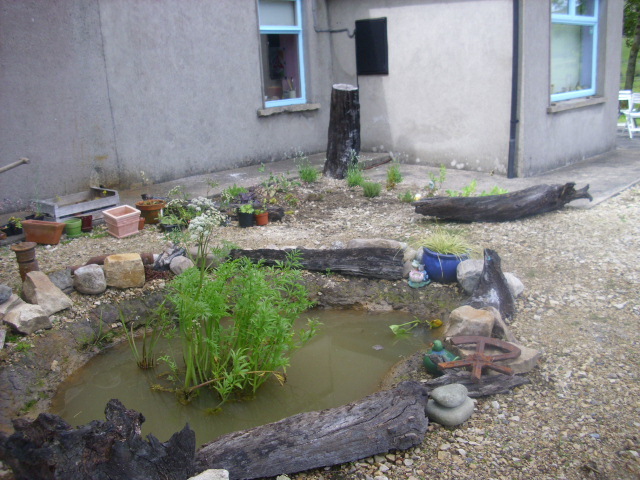 I have been collecting bits of driftwood, stones and old bits of ironwork to put around it, sort of Derek Jarman styleish! 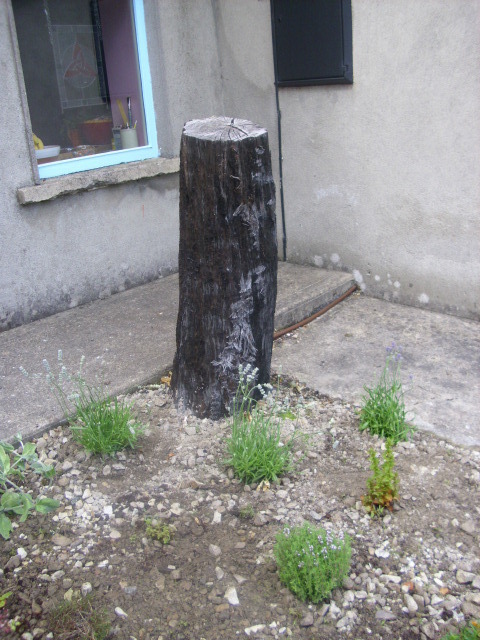 This lovely lump of bog oak I got on one of the Tipperary visits. My brother and I often go walking on the bogs and that’s where we found this and a few other bits that had been dug up by the peat harvesting machines. These trees have been lying in the bog preserved by the peat for thousands of years. 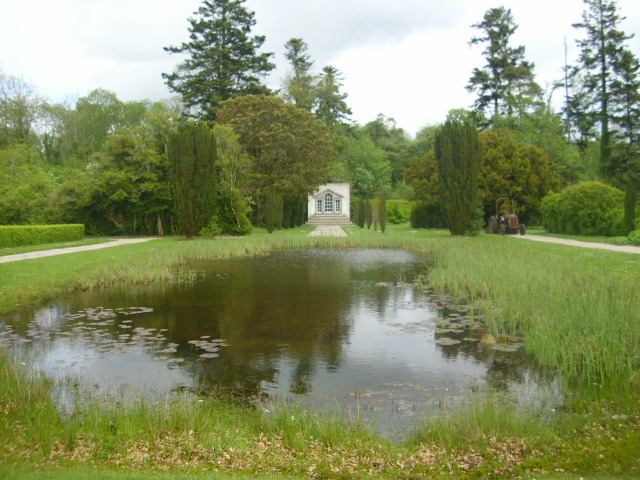 This was probably growing before Newgrange was built. Amazing! Have planted Lavender, Sedums, Saxifrage, Thyme and Eryngium around it. 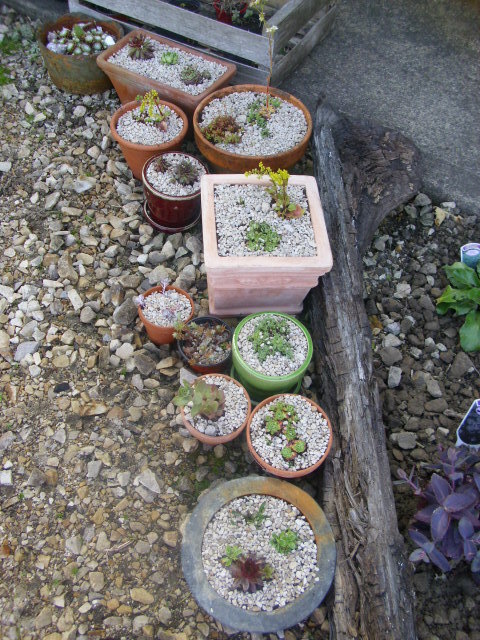 Lots of succulents have been planted up in pots and grouped together, this will be added to as time goes on. 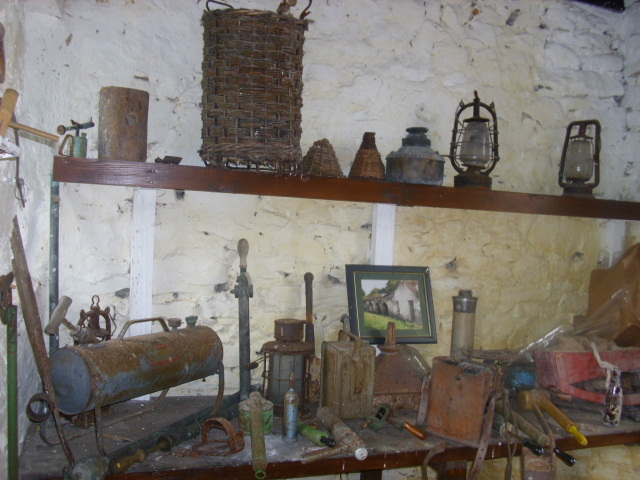 The piece of bog oak was from the same bog excursion. Like the rest of the garden areas this will be a continuing work in progress. 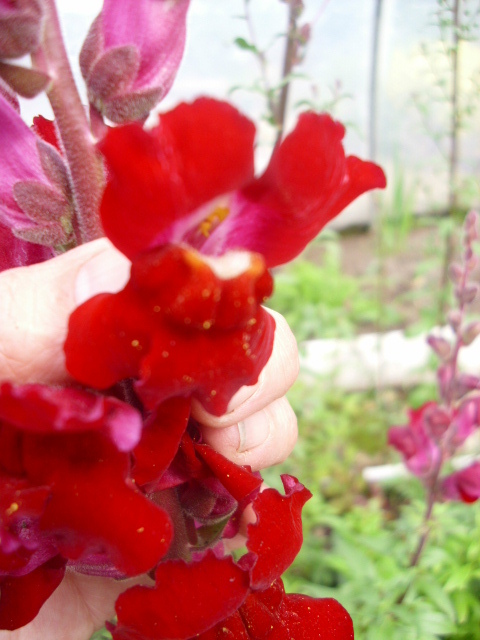 Garden Musings on June 1st. 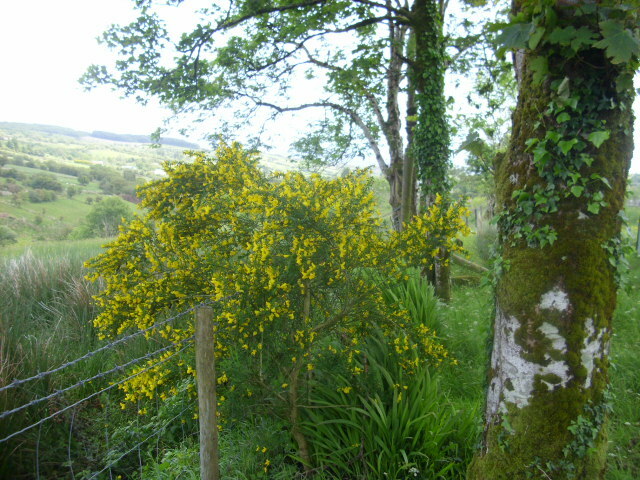 Broom is in flower at the moment. 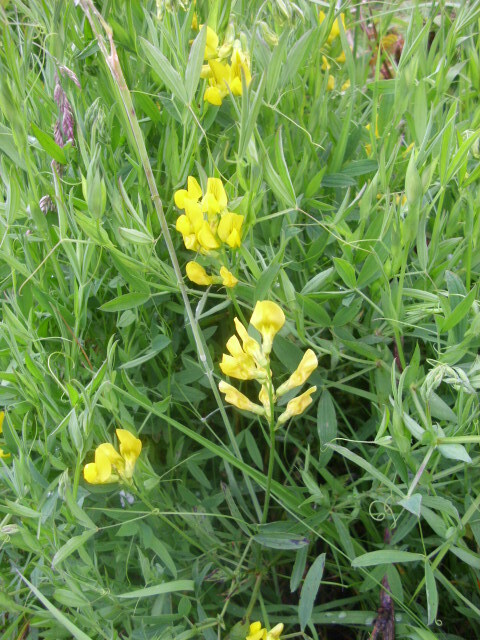 This is the native variety, Cytisus scoparius. It grows plentifully by the river where I often take the dogs for their wash. 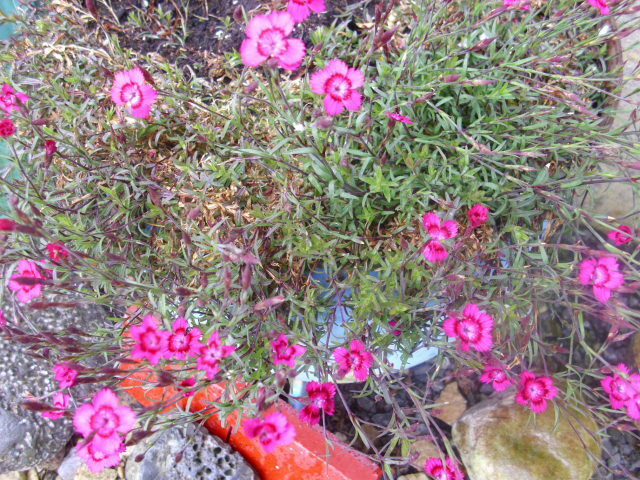 I brought this plant as a self sown seedling 2 years ago to see how it would do. It was about 6 inches high at that time. It is now about 5 feet. Think I will have a few more on the next river visit. Broom is used in homeopathy to treat irregular heart rhythms. It does not have any herbal uses as all parts of the plant are poisonous. 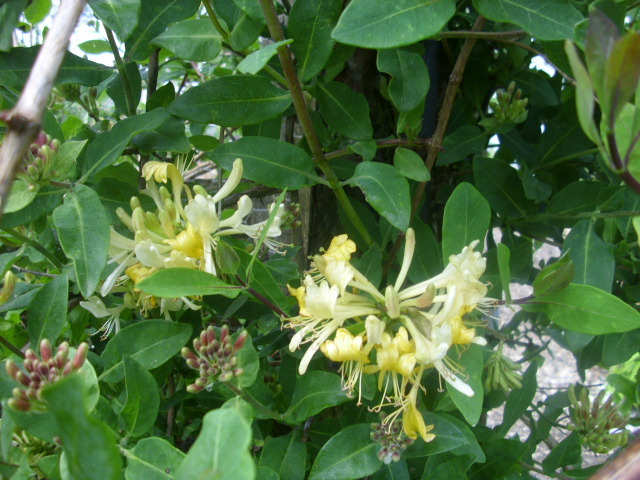 Honeysuckle has also started to flower. 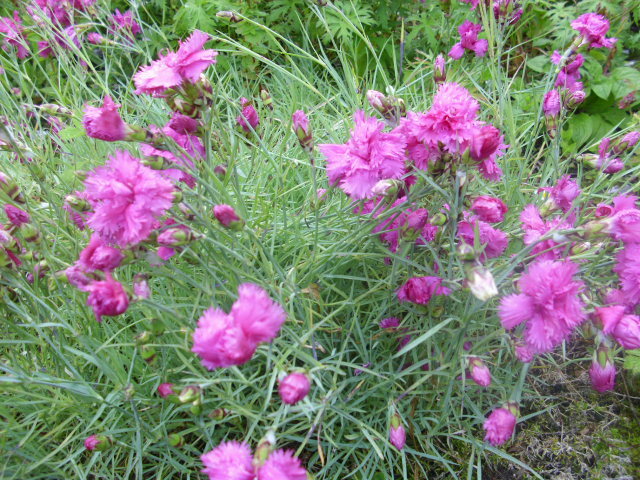 This is the wild one which grows in the area. The flowers emit a gorgeous scent. Also called Woodbine it grows easily from cuttings. 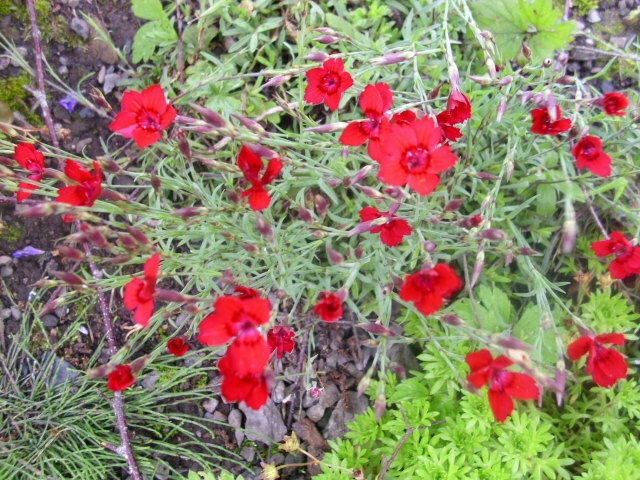 The plant does well in sun or shade although it produces more flowers when in a sunny spot. 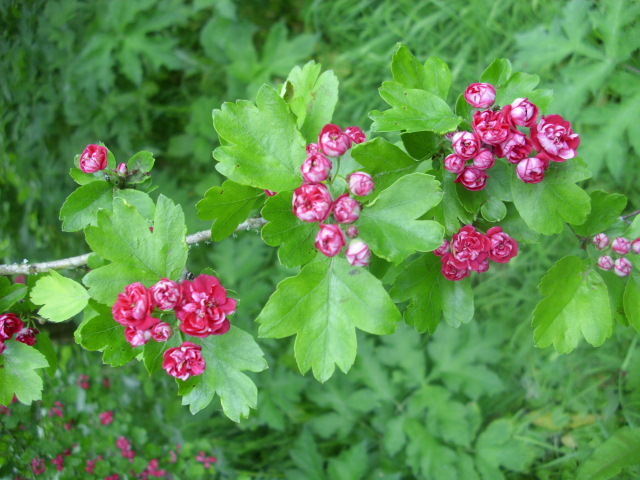 Red berries appear after the flowers, these are highly poisonous. 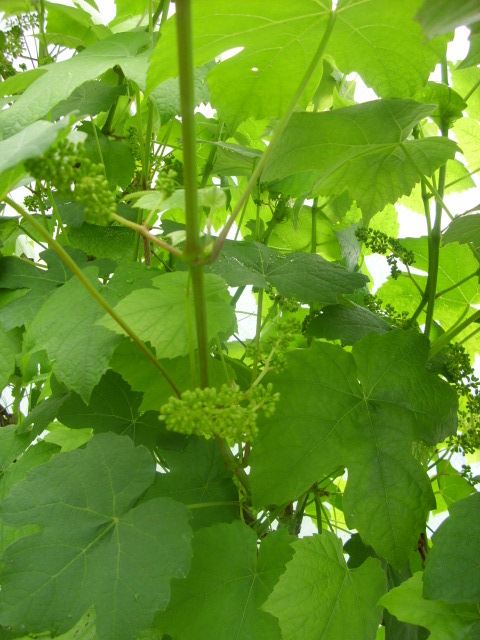 In the polytunnel the Grape has produced lots of flowers. The variety is Black Hamburg. 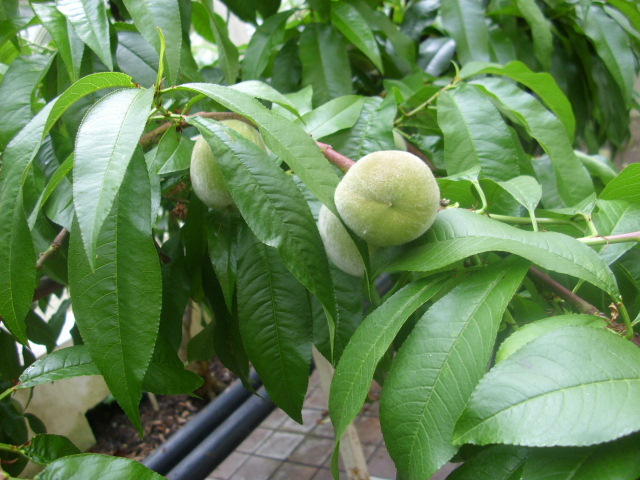 This is a good variety for a polytunnel as it will ripen without extra heat. There is lots of vigorous growth at the moment. 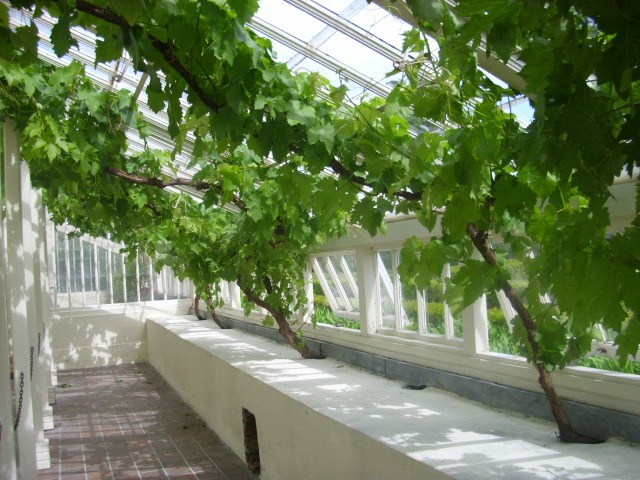 I usually prune a few times during the Summer cutting back to 2 leaves beyond the truss. Last year we pressed the grapes and froze the juice, it was great to have our own Grape juice in the heart of Winter. Might try making wine this year. 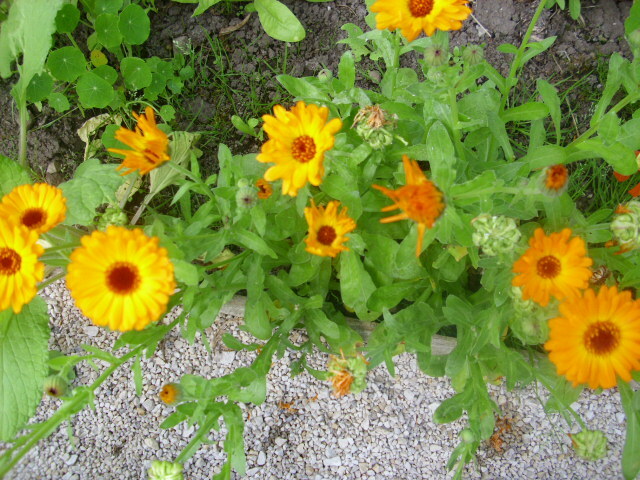 Calendula officinalis or Pot Marigold as it is commonly called is a very useful plant. The leaves are edible and look so lovely sprinkled on a salad. It also has medicinal use as it has soothing, healing and antiseptic properties. The flowers can also be made into an infusion to help digestion , promote bile production in the liver and for use as a mouthwash for gums especially useful after tooth extraction.